A last ditch bid to save the Ribble Valley libraries, children’s centres and elderly services faced with closure due to swingeing budget cuts by Lancashire County Council has been made. And Conservative county councillors have vowed not to “give in” if the worst scenario happens as the Labour controlled authority meets today to make the final decisions. In a rallying call County Coun. David Smith said: “I am personally not giving in over the decision on closures. A petition was launched this week calling for the reversal of the proposals to close vital services and slash funding to many. The petition also calls on the Labour leader County Coun. Jennifer Mein to take action. These issues will be debated at county council scrutiny meeting on Tuesday and petition forms need to be returned to the Ribble Valley council offices in Railway View, Clitheroe by Monday. or handed over to any borough or county councillors so they can be presented to the committee. Conservative deputy group leader County Coun. Albert Atkinson said the cuts on the table would affect the “most vulnerable” in society. The Ribble Valley faces the closure of Whalley, Read and Chatburn Libraries, Slaidburn Childrens Centre and Springwood Childrens Centre, Whalley. Ribblesdale Childrens Centre in Clitheroe is also down to lose its funding. The Youth Centre on Berry Lane, Longridge owned by the Ribble Valley Borough Council is being kept open along with the Childrens Centre which in the civic hall. 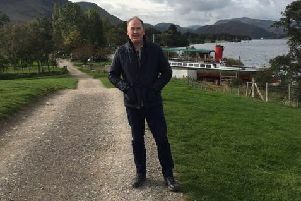 Longridge councillor and former MP Ken Hind said: “This appears to be a short term reprieve as it will be reviewed before 2020 with a view to being part of a neighbourhood centre, not identified by site or location. “The location cannot be identified because the Longridge Library chosen by the county as a neighbourhood centre for its services is unsuitable and cannot be adapted to amalgamate library childrens and youth services. ● The deputy leader of Lancashire County Council has hit back at accusations that the authority is playing “political games” with the people of Lancashire. County Coun. David Borrow spoke out after Ribble Valley MP Nigel Evans slammed budget cuts, which will include the closure of 20 libraries and over 100 buildings as being politically driven. County Coun. Borrow said: “The bottom line is Nigel and his Tory friends who have voted to cut funding for the county council are trying to shift responsibility for the consequences. He also hit back at the MP’s claim that the county council was continuing to sit on cash reserves totalling more than £300m, saying: “At the February budget meeting ,which Nigel attended, it was explained how the reserves would be almost depleted by April 2018 based on the budget that was agreed and further major savings would have to be found. “This is confirmed in the report just released for next week’s Cabinet meeting.